As I mentioned in the preview to this inspiration board-this year I will be having a very casual thanksgiving so I wanted to dream up a more formal thanksgiving for this inspiration board. So, here it is! I think my favorite part is the idea of dining by a beautiful candle lit fireplace. yes--and i would love to have that dress while sitting by that fireplace! This is take-your-breath-away beautiful! 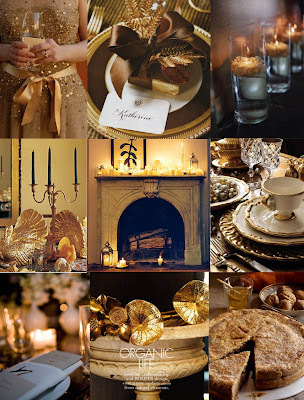 I so love gold for holiday entertaining (err, might be biased b/c my china has a gold pattern...) Just stunning. I would be thrilled to attend this gorgeous Thanksgiving! Thanks a lot. This is so beautiful.